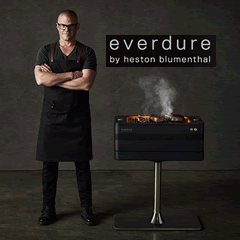 The Lotus Grill is a compact, attractive charcoal grill that boasts minimal smoke production. It is easy to start, easy to use, and easy to clean, and it is an inexpensive but high quality alternative to a lot of the portable BBQ models that are on the market today. 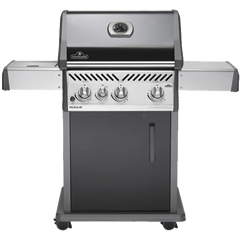 The grill is renowned for its unique design, which gives it its name, and also for its innovative use of battery operated fans. 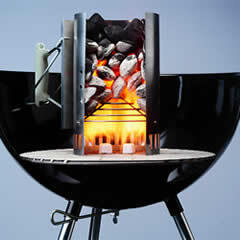 The fans supply the charcoal with air, which helps keep them hot and provides you with a better cooking environment. The fans also help disperse the smoke, so that you aren't met with a face full when you open the lid and get ready to cook. You can choose from a selection of great looking colours, and a range of different sizes, but regardless of which model you choose, you will enjoy great value for money from a table top grill that is surprisingly powerful and that enables you to make great tasting food even if you are seriously restricted for space. Lotus Grills also offer a range of accessories to help make the barbecuing experience even simpler and more efficient. We love innovation at BBQ World, and the inclusion of battery operated fans is a simple idea that has not been utilised often enough on charcoal grills - there is nothing worse than being confronted with a face full of ash filled smoke when you open the lid of your grill. It's unpleasant and unhealthy, and the Lotus Grill prevents this from happening. 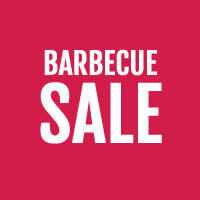 Buy a Lotus Grill from BBQ World today and enjoy free delivery on any order over £50. Alternatively, call us with any questions or call in to Dawson's Department Store, where you will find all of our barbecue, gardenware, and homeware ranges for you to browse. Setting up the grill is easy, following the provided instructions, and it shouldn't take you long before you can start grilling your first meal with what has become dubbed the smokeless grill. Add a 2 to 3 capfuls of the lighter gel on the plate below the charcoal tray, and wait for five minutes, and you can start cooking straight away. There's no need to wait around for 30 minutes before you start preparing food. You may experience a small amount of smoke when you first start the grill, especially if there is any dust, dirt, or debris that has collected since your last use. You may also see a puff of smoke when fat drips off food, but the fans do a very efficient job of removing this smoke in a few seconds. In order to enjoy the full benefits of the smokeless grill, you need to keep the barbecue clean. Fortunately, the Lotus Grill has been specially designed so that it is very easy to clean. Remove any excess fat and then place the grill plate and inner bowl in the dishwasher. Alternatively, use warm water and mild detergent to wipe the grill down. Try to cover the BBQ when not in use, because this will help prevent a dust build up that might give off a small amount of smoke when you next light it. As with any barbecue, it is advisable to clean after every use. This prevents debris from collecting and become ingrained and difficult to remove without harsh and abrasive scrubbing. Also try to avoid using steel wool or other abrasive pads and cloths. Light the grill is also a simple task. Remove the charcoal tray, add 2 or 3 capfuls of Lotus Grill lighter gel. Turn the fan on, light the gel, and then replace the charcoal tray on top, having already filled the tray with your chosen charcoal. 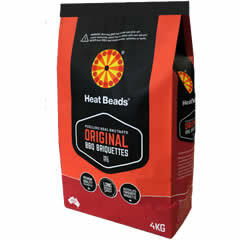 The lighter gel is available from hardware stores and from our website. There may be a little smoke initially, but once the grill has settled down, there will be virtually no smoke thanks to the fans. There are several models of Lotus Grill available. The standard Grill provides ample space to cook enough food for up to 5 people while the XL has room for enough food for 10 people and the XXL can provide enough food for as many as 25 people, although it obviously depends on what you're cooking and how much your guests eat. Beyond the size, the design of the grills is almost identical, but you can choose from a varied range of colours. At BBQ World, we not only stock a selection of the Lotus Grill models and colours, but accessories that are designed for use on these models too. Buy charcoal, replacement lids, plastic food tongs, grill cleaner that makes it even easier to maintain these high quality, portable grills. Buy a teppanyaki plate to further expand the dishes you can cook, or a lid to enhance the cooking options available to you. The fans are the innovative feature that really make this grill stand out. They will effectively remove the smoke that is naturally produced during the lighting and cooking phases. They are powered by two AA batteries, which are readily available from shops all over. The batteries also power the light on the fan operating knob. As well as reducing the smoke to virtually none, the fans can also be used to help control the heat and the cooking temperature inside your barbecue. If you see the flames reaching above the grill level, adjust the fan to reduce flame size, and you should be ready to start cooking within just a few minutes of ignition. The modular design of the grill is another great feature. The grill has been designed in this way, so that you can easily add the lighter gel under the coals, and also so that you can replace the fan batteries, but this type of design also makes it a lot easier to clean. We have all had one of those barbecues that won't come apart, and they are virtually impossible to properly clean. Not only can this taint the taste of the food that you cook, but it can also shorten the life of your barbecue. This isn't true with the Lotus Grill. Remove the grill and the charcoal tray, and you can wash them separately. They can even be put in the dishwasher safely. You can even get a travel bag that can be used for storage or so that you can easily transport the grill when you go away or if you are visiting friends and family and want to take your Lotus Grill with you to show it off. Lotus Grills are innovative and extremely functional. The battery powered fan greatly reduces the amount of smoke produced, even when lighting and when fat drips onto the charcoal. 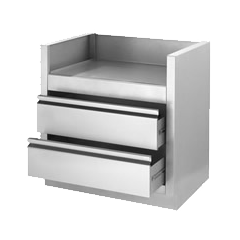 The modular design makes the grill easy to clean, and you can easily move and store the whole thing after each use. The choice of size and colours that are available means that you can get the grill that best suits your personal design tastes and that offers enough cooking space for the number of people you prepare food for. Outdoor cooking and dining really enable you to take advantage of good weather and to benefit from outdoor space that you might not normally use. With that said, we don't all want a huge gas barbecue, and many of us don't like the smoke that a barbecue produces. The Lotus Grill is not only compact, with a small footprint, but is called a smokeless grill because the battery fans remove almost all of the smoke from the grill. Buy today from BBQ World and we will deliver any order with a value of £50 or more to your UK address for no extra charge. You can also call us or call in to Dawson's Department Store to see our full collection.